Presumed to be a procession to mark the end of World War I (WWI), showing the corner of The Square and Coleman Place. The C M Ross department store is decorated with colours of the Union Jack. 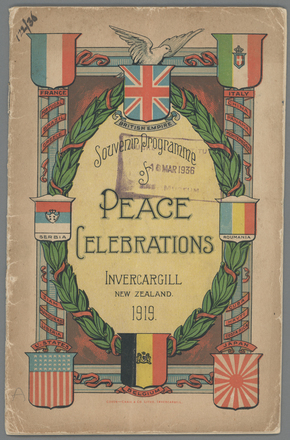 Peace celebrations were held throughout New Zealand. Most communities held a Soldiers’ Day, a Day of Thanksgiving, and a Children’s Day on Saturday 19, Sunday 20 and Monday 21 July 1919 respectively. Soldiers' Day during the 1919 peace celebrations. Townspeople gather outside the Ōpunake Post Office in Taranaki during First World War peace celebrations, 1918.
Who made up the committees that organised the peace celebrations in local communities? Photograph of peace celebrations after the end of World War I. Taken by an unknown photographer in Rawene, Hokianga in 1919. Quantity: 1 b&w copy negative(s). Programme for a victory fete, to celebrate the armistice signed by Germany and the Allies, on November 11, 1918. 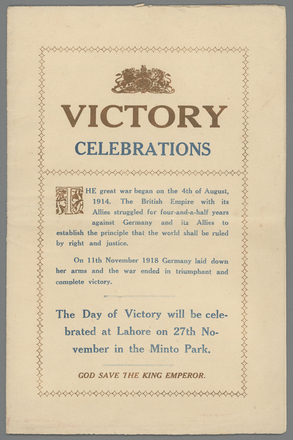 Recto: "The Day of Victory will be celebrated at Lahore on 27th November in the Minto Park. God Save the King Emperor." Shows part of the crowd gathered on the oval in Masterton Park, to celebrate the peace following World War One. 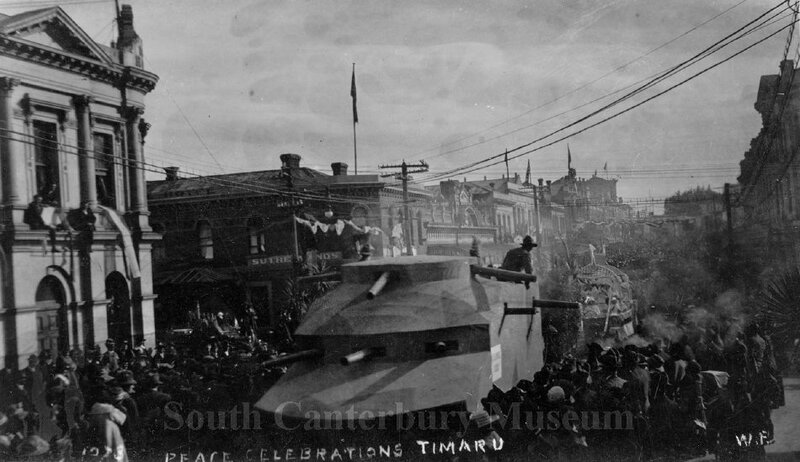 Shows a float of an armoured tank during Peace Day celebrations in Masterton. The float is in Queen Street, leading a procession of vehicles. The Post Office can be clearly seen above the float and in the background.